Civil Air Patrol inducts legislators into the fold. 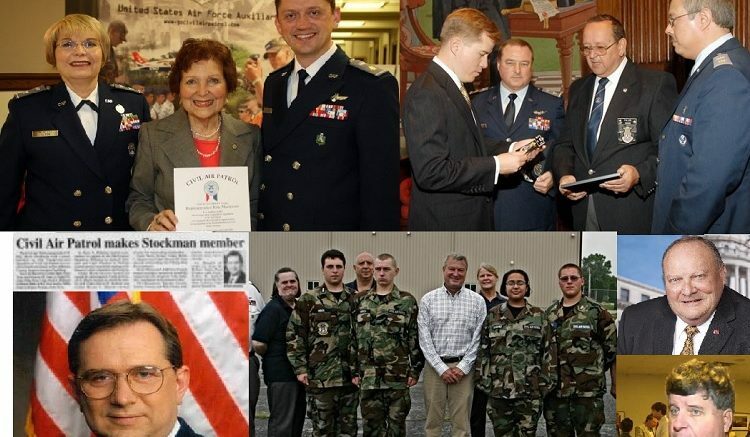 Civil Air Patrol inducts Wisconsin Assemblyman Joel Kitchens. Civil Air Patrol inducts Sheila Harsdorf and Terry Moulton into the Wisconsin Legislative Squadron. Civil Air Patrol inducts Washington State Representative Mary Dye, of the 9th Legislative District, into the Washington State Legislative Squadron. Civil Air Patrol inducts Virginia Delegate Buddy Fowler into the Virginia Legislative Squadron as an Honorary Major. Civil Air Patrol inducts Mississippi state senator Timothy C. Burton into the Mississippi Wing Legislative Squadron. Civil Air Patrol inducts Virginia State Senator Frank Wagner in to the Civil Air Patrol Legislative Squadron in recognition of his support for the volunteer organization. Civil Air Patrol inducted U.S. Rep. Michael T. McCaul (R-TX) into Civil Air Patrol’s Congressional Squadron as a lieutenant colonel after his October 8 return from a Texas Wing aerial tour of the Texas-Mexico border and Hurricane Ike recovery efforts on Galveston Island. Civil Air Patrol inducts suspect Missouri Governor Matt Blunt into the Missouri Wing’s new Legislative Squadron in a special ceremony held in the Governor’s office at the state capitol in Jefferson City, Missouri, on November 14th. Civil Air Patrol inducts US Congressman Robert Ehrlich Jr (R-MD) to the Congressional Squadron. A ceremony, presided over by CAP Col. Gene Przybylowicz, Maryland Wing commander, was held at Aberdeen Proving Ground National Guard Facility. Be the first to comment on "Civil Air Patrol Inducts"